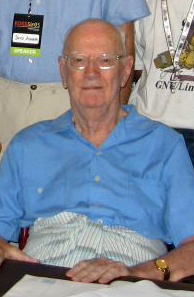 Arthur C. Clarke, one of the few true visionaries of science and science fiction in the twentieth century, died today. Clarke is in a very select category of people, along with a few others like Isaac Asimov and Carl Sagan, who not only showed what the future could be but also worked to help create it. Anything I write would be insufficient to describe his impact on the world we live in, both through influencing others and his own direct contributions, so I’ll just say he will be missed.